The Resident Evil series is one that you either love or hate. There doesn’t seem to be much in between, and for obvious reasons such as strict control schemes, odd camera angels, and a clunky inventory system that make Resident Evil 5, like it’s predecessors, feel a little out-dated. My first venture into the RE series was back in 1998 with RE2 on the original PlayStation. Since then, I’ve played all of the GameCube remakes and of course, the critically acclaimed RE4. Over the years I’ve watched the series evolve and have appreciated the strides Capcom has made to try and better the experience. While RE5 isn’t as much of a revolution to the series as RE4 was, it’s an incredible ride from start to finish, and one that fans of the series will not want to miss out on. At the same time, new comers should probably be weary and rent before buying. With the exception of Leon Kennedy being the lead character in RE4, there really wasn’t much in that game that tied it to the previous games in the series. There was a new enemy force behind a parasite outbreak, as opposed to the evil Umbrella corporation and their bio-terrorism. RE5 takes a similar path parasites being responsible for the zombie-like baddies. But makes quick work of bringing many familiar faces and story arcs back into the forefront from past games. At first, I wasn’t overly thrilled with the direction it was going, but they’ve really done a great job of tying up lose ends and basically closing the book on the Umbrella chapter of the RE story. It feels like we’ll like see an entirely new direction with RE6. It’s truly amazing what the current generation consoles are capable of handling, when it comes to visuals and audio. I was floored by Killzone 2 on the PS3 just a few weeks ago, and now RE5 had me drooling wide-eyed yet again! It truly is a gorgeous game, despite being filling with some of the nastiest things we’ve yet witnessed in games. I remember a moment while playing RE4 with my wife where I said, “Can you even imagine how the next RE game is going to look?” While RE5 has lost a bit of the eeriness in return for more action based gameplay, the gross factor is still through the roof. Similarly, the sound effects and music are top notch. I don’t recall ever noticing the music in an RE game before, but I certainly did while playing RE5. There seems to be much more in the way of full orchestral music that kicks it at the appropriate moments to set the mood. I’ve already written about the controls, so I’m not going to get too into that topic. It basically boils down to the player. If you’re able to accept them, you’ll have a good time playing the game and will likely get through it without struggling too much with them. Play the demo a few times, and if you still haven’t grasped them, move along. At this point, my only beef is that I wish there was more in the way of free movements and actions. There are triggered melee attacks and the ability to take cover on certain objects, jump or climb when the game says so, etc. I would have liked to have been able to melee whenever I felt it was necessary, and had the ability to dive and roll out of the way. What would a Resident Evil game be without epic boss battles? Well, it wouldn’t. And RE5 is packed with 16 awesome fights that are more enjoyable each time you play them. What was that? Oh, right.. there’s 17 boss battles. I was excluding the final one, as it was a massive step in the wrong direction and truly put a damper on the experience. Thankfully, I found a handy little trick with upgrading weapons that allowed me to stock up on ammo when I died, which helped me get through it eventually. But I ended up dying 20 times in the last chapter, while I had died at the most 2 times in any previous one. 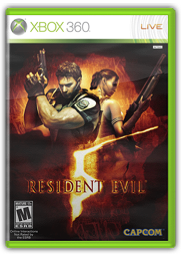 Resident Evil 5 is the first game in the series to include co-op gameplay. Even while playing solo, your partner Sheva is with you from start to finish. There are times where you’ll get separate briefly and one is usually responsible for covering the other while a task is fulfilled. But Sheva’s always got your back. While she might not be the best ally ever, she’s at least there to double your inventory spots and is always good for a quick heal when your health bar is getting low. Not to mention, she’s a pleasant sight amongst all the nastiness the game dishes out. Playing solo is fun, but co-op is where it’s at. It’s truly a shame that the split-screen is as awful as it is. But thankfully, I’ve recently picked up a second Xbox 360 and will be playing through again locally with my wife. I believe I played through RE4 completely 3 times, and had started a fourth. The upgrade and unlockable system gave good reason to do so, and RE5 does a good job of keeping your focus even after completing the story. Aside from extra goodies, there’s a new mode called Mercenaries which first made an appearance in RE4. It’s basically a timed survival mode where you run around a small area as hordes close in on you. There are collectible items through-out which unlock even more goodies, including additional playable characters. In short, RE5 is a fantastic game filled with additional modes and plenty of unlockables to keep you playing long after you’ve completed the story. Veterans of the series will have no problem picking up the controls and will enjoy every second. While new comers while either take some getting used to, or will flat out hate it. Having played through the game once myself, I know that I’ll be replaying it at least once more. And will likely play several rounds of Mercenaries. It’s safe to say, RE5 has a permanent place in my collection.